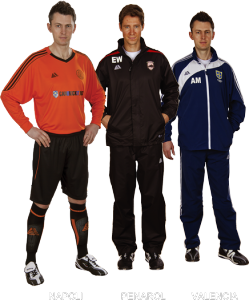 Pendle Sportswear has brought out several new ranges for the 2012/13 season. The NEW Napoli football kit range is already proving popular due to it’s modern design and extremely competitive price. The NEW Valencia Tracksuit looks great and particularly compliments our Santos Football Kits Range. After many requests, we can now offer the NEW, FULLY WATERPROOF Penarol range of rainsuits. This offers great value for money and full protection from the terrible weather that seems to be the norm these days!! Please visit our website to view all the deals on offer. We are sure that you will be happy with the prices!